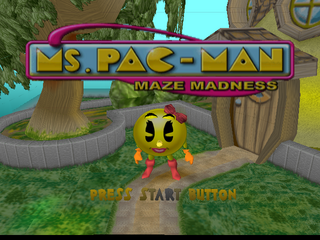 Ms. Pac-Man Maze Madness is an entry in the Pac-Man series, released for the Sega Dreamcast in 2000. The Dreamcast version was exclusive to North America. The game builds on the formula seen in Pac-Man and Ms. Pac-Man by presenting a 3D world filled with new obstacles and puzzles. The original arcade game is also included. Main article: Ms. Pac-Man Maze Madness/Magazine articles.